Robust economic growth of 8.6% (CSO advance estimates) in the FY11 supported by a rebound of farm output growth at 5.4%, a vibrant services and construction sector activity trotting up a growth of around 10% and 8%, respectively, and a comfortable manufacturing sector growth at 8.8% shows that we made up the lost ground quickly in comparison with advanced economies and most emerging ones too. However, it is equally true that high inflation and rising interest rates may dampen the momentum of growth. Besides, the persistent uncertainty in advanced economies could still affect economic activity in the country through financial channels. In this backdrop, reforms in agriculture, infrastructure, and quality of life would be critical in the upcoming budget to sustain the current growth momentum. Besides, FM may take measures to boost industry growth and to control inflation. Agriculture reforms are necessary not only to the fact that more than 60% population is still dependent on this sector but also to tackle food inflation vis-a-vis remove output gaps and to sustain higher economic growth. 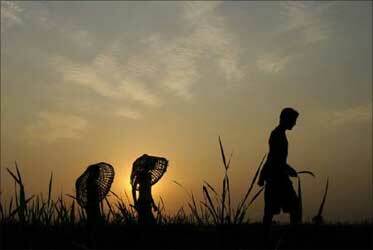 Six steps would be critical to push agriculture reforms. Minimise the wastages by augmenting storage capacities, modernizing/ upgrading the godowns. Increase public investments in agriculture sector to improve agriculture infrastructure from farm gate to agricultural markets. Strengthen procurement system through alternative forms of marketing. Strengthen the role of agricultural universities and to monitor the usage of the sanctioned amount. Technology to improve the yield/productivity along with expanded irrigation facilities and fertiliser availability. Ensure credit availability to small & marginal farmers to adopt modern farm techniques. Remove hurdles in the marketing of produce such as octroi and mandi taxes. It may be mentioned that India's real GDP grew at an average around 7% per annum during however, the agriculture sector grew at an average of 2.5% per annum during the same period in which the average rate of growth of foodgrains was just 1% per annum. The population during this period grew by 1.6%. Infrastructure development is critical to improve our competitiveness. Poor quality of roads, shortages of power-supply and inadequate ports and airports infrastructure adversely affect our competitiveness. Infrastructure development is also critical to achieve higher exports targets of $500bn by 2015 and to generate more employment in the economy. Infrastructure has emerged as the biggest constraint to sustain the high economic growth. 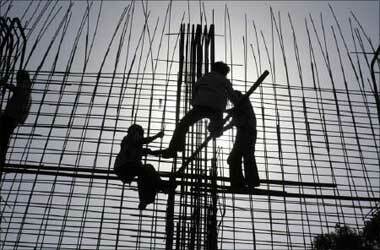 India is ranked 86th out of 139 countries in the quality of overall infrastructure. It is much below in comparison with the other emerging economies such as China at 50, Brazil at 62. The gap in infrastructure stocks is so large that to catch up with China's present levels of infrastructure by 2015, India needs to invest 12-13% of GDP per year. In 1980 India actually had higher infrastructure stocks in comparison with Chins -- in power, roads and telecommunications - but China invested massively in infrastructure, overtaking India by 1990 and this gap is widening. Image: Labourers work at a riverfront construction site near the Sabarmati river in Ahmedabad. FM may augment public investments, exclusive private investments and a mix of public-private investments in infrastructure sector -- enhance the Rural Electrification, Bharat Nirman and National Urban Renewal Mission (JNNURM) by providing greater outlay and well defined and periodically measurable outcomes. Improvement in quality of life is critical for sustainability of growth at higher level and for a sustained period. Although India has emerged as second fastest moving economy among the large emerging economies, the developmental situation, especially at the social front is not satisfactory. 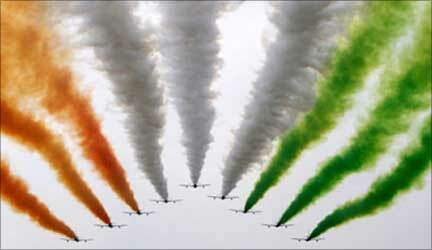 It may be noted that India ranks a low 119 among 169 countries on the 2010 Human Development Index compiled by UNDP. 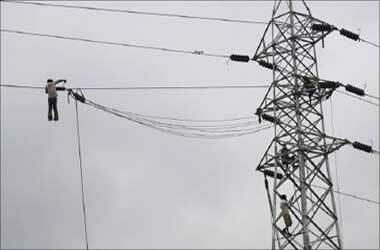 Image: Labourers work at an electric pylon. Hence, Budget may augment investments in social infrastructure--particularly in the critical merit goods of quality of life, viz., education, skill-development, basic health and safety in order to make people partners in progress. Apart from these three basic ingredients, the most important challenge before the budget is to ensure that the commitment of the government towards resuming fiscal consolidation shown last year is continued in the forthcoming budget too. The forthcoming Budget will have to spell out the medium term strategy for fiscal consolidation to ensure growth. Besides, FM is expected to boost the industry growth and control rising inflation by introducing certain innovative fiscal measures. May focus on simplification of the tax structure and provide clear road map for implementation of GST. 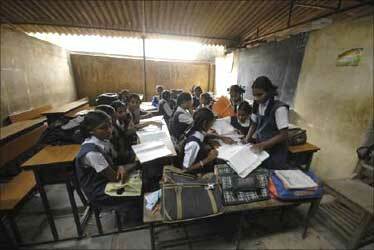 Image: Schoolgirls study in a classroom of a government-run school in Hyderabad. Since CST was supposed to phase out before the implementation of GST, at this juncture CST may be reduced to 1%. Customs duties may be lowered on essential items to control the price rise and to create competition in the domestic economy. Excise duties may keep at the current level or reduced by 1% age point to control spread of inflation in manufacturing processes. May also look at reducing taxes on petroleum products to bring down the costs. May provide some relief in income tax slabs to increase personal disposable income in the supply constrained inflationary economy. May provide further tax incentives in infrastructure investments. In conclusion, some effective policy interventions may help harness the country's potential and put the economy on the sustained growth path for a sustained period. The need is to address supply constraints in the economy through reforms in agriculture and infrastructure sectors. Along with this, the improvement in quality of life will spur higher economic growth and confidence in the markets, going forward. 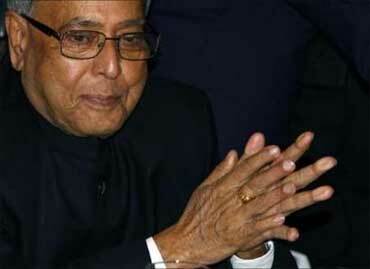 Image: Finance Minister Pranab Mukherjee.